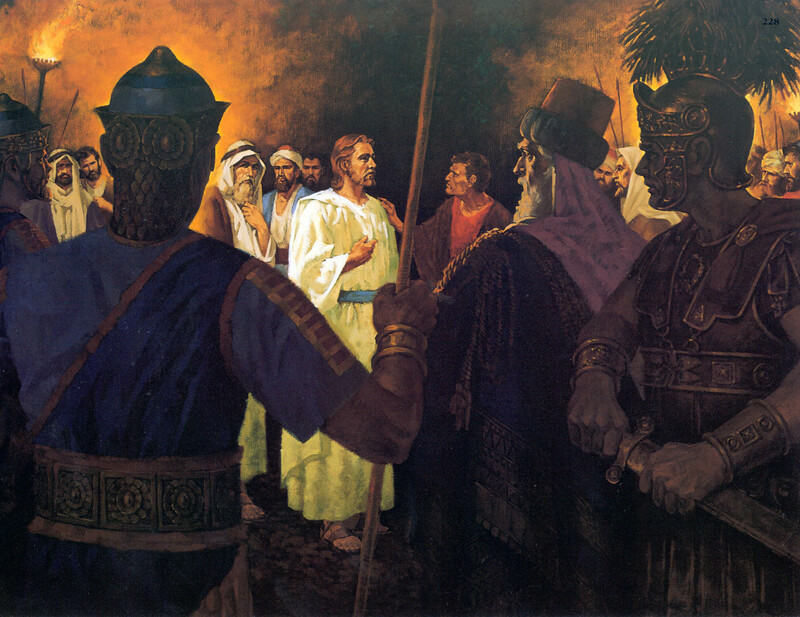 I have always been fascinated by the events surrounding Jesus’ arrest. Most of my students do not know that the italicized words in the King James Version of the Bible are not actually in the Greek and Hebrew texts, but were added by the King James translators to help “make more sense” of what the text was saying. While this is oftentimes useful, there are times when the italicized words can make it so we miss important points. John 18 is an excellent illustration of what I am talking about. In John 18 we read that Judas comes with a “band of men and officers from the chief priests and Pharisees…” (John 18:3) seeking to arrest the Savior. When Jesus asks who they are looking for, they respond by telling him that they are seeking Jesus of Nazareth. We read, “Jesus saith unto them, I am he. And Judas also, which betrayed him, stood with them. As soon then as he had said unto them, I am he, they went backward, and fell to the ground. Then asked he them again, Whom seek ye? And they said, Jesus of Nazareth. Jesus answered, I have told you that I am he: if therefore ye seek me, let these go their way” (John 18:4-8). Jesus does not really say I am he- he says, “I AM” – a phrase that the Jews were familiar with, as it goes back to the time when Moses approached Jehovah and asked how he should prove to the Israelites that he had been commanded of God. When asked what name he obeys, he was told, “I AM THAT I AM… Thus shalt thou say unto the children of Israel, I AM hath sent me unto you” (Exodus 3:14). By invoking his name, Jesus sends an entire force of arresting officers, a band of men consisting of temple soldiers and Roman officers. The detachment of soldiers (speira) refers to a cohort, a group of 600 soldiers under a military tribune (chiliarchos, vv. 3, 12; NIV, commander). The entire cohort probably would not have been deployed on this mission, but this still would have been a large body of men who came to arrest Jesus Christ in the Garden of Gethsemane this night. The whole point in this exercise in showing this to students is to emphasize the fact that during this entire night, Jesus was in charge. He was in complete control of the situation, and there had to be some in his presence that felt this. How could he have leveled an entire group of professionally trained soldiers in this manner and they not know that this was no ordinary night, no ordinary person they were arresting? The application for students in seminary is important to make. Though we may be going through challenging times and circumstances in the Last Days, we must not let our hearts be troubled. We must press forward, knowing that Jesus Christ is the captain of our souls! John does not mention Judas’s kiss, which would have taken place just before or after Jesus’ question. Judas here takes his place with those who have come out against Jesus (v. 5). The awkward statement that tells us where Judas is, which the NIV puts in parentheses, is an eyewitness detail branded into John’s memory. We sense his shock at seeing Judas with them. John’s continual reference to Judas as the betrayer all stems from this event. John makes it clear that Judas is not the revealer but rather that Jesus will identify himself. Enemies had not been able to lay their hands on Jesus before (7:30, 44-45; 8:59; 10:39; 12:36), and it is not Judas’s presence that now brings success. Rather, it is now the Father’s will. They say they are looking for Jesus of Nazareth, and Jesus responds, I am he (v. 5, ego eimi). Here the most humble and human of Jesus’ names is juxtaposed with the most exalted and divine. The two together are the cross hairs that target Jesus’ identity: he is the human being from an insignificant, small town in Galilee who is also God. Jesus’ self-identification has been at the heart of this Gospel, and this public act of identification produces dramatic effects. When he uses the divine I AM they drew back and fell to the ground (v. 6). People falling to the ground in the presence of God are mentioned elsewhere (for example, Ezek 1:28; Dan 10:9; Rev 1:17), but here the ones falling are his enemies rather than his worshipers. This reaction is closer to that of Pharaoh, who fell down as though dead when Moses said the name of God, as told by Artapanus, a pre-Christian Jewish apologist (Eusebius Preparation for the Gospel 9.27; Talbert 1992:233). This reaction is a reflection not of their hearts, but of Jesus’ majesty. Here is a little preview of the moment in the future when every knee will bow to Jesus (Phil 2:10) and all things be brought into subjection to him (1 Cor 15:27; Phil 3:21), even those who do not own allegiance to him and thus for whom this submission is hell. Jesus puts the question to them again (v. 7). The impression given by this passage is that they have been completely neutralized and that he must allow the events to proceed and give them permission to take him (cf. Talbert 1992:234). Amazingly, they answer the same as before: Jesus of Nazareth. They have just experienced the numinous, and it has not spoken to them at all. They are just doing their job, like those sent to investigate John the Baptist at the beginning of the Gospel (1:19-27). This repetition of the question “Whom do you seek?” emphasizes its importance, for it focuses on Jesus. It is also a question that searches the soul. 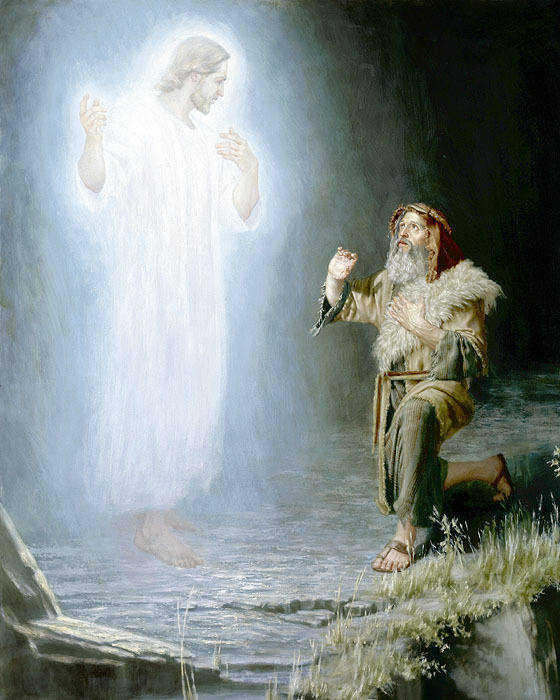 The very first thing Jesus said in this Gospel was, literally, “What are you seeking?” (1:38), his question for the two disciples of John the Baptist, and their reply indicated they wanted to be with him. Now we see people seeking Jesus, but they do so not for their soul’s sake. They have their own agenda, as many people do today. There are ways of seeking Jesus that do not bring life. Jesus repeats the I AM but now allows the proceedings to continue by telling them to let his followers go (aphete, an imperative). He issues orders to those arresting him! Their power has just been shown to be insignificant compared to the power of his word, and now the fulfillment of his word is the operative force, not their designs (v. 9). The formula used to speak of the fulfillment of Scriptures from the Old Testament is now used of Jesus’ own words. The Word himself, who created all that exists, has spoken of his protection for those the Father has given him (6:39; cf. 10:28; 17:12), and now he fulfills that word. The protection Jesus spoke of earlier referred to eternal salvation, and now we see that such protection includes occasions of temptation that threaten to overwhelm the disciples’ faith (cf. Bultmann 1971:640). Here is Jesus as the Good Shepherd caring for his flock, a glimpse of the grace that is at work throughout the Passion as it has been throughout the ministry. The temptation the disciples face here is an extreme case of what all temptation represents. And the Lord’s protection is as necessary in the day to day assaults as it is in this great test. It is not without reason that our Lord commanded us to pray daily not to be led into temptation (Mt 6:13 par. Lk 11:4; cf. Mt 26:41 par. Mk 14:38 par. Lk 22:46).